In our previous post on The Great Departure, we followed Siddhartha’s escape from the prison of his father’s palace. 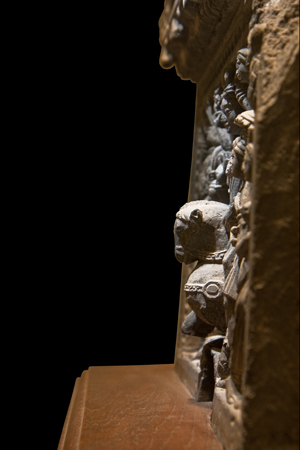 We looked at a Buddhist relief showing the moment of Siddhartha’s liberation and noted that the physical penetration of the artwork into a new dimension, reflected Siddhartha’s awakening–his penetration into a new dimension of consciousness. Whilst Siddhartha is yet at the threshold of awakening, a new and meaningful element enters the narrative of his story, one that will beset him throughout the next phases of his evolution. This element is Māra, the opponent of liberation. Māra personifies opposition. 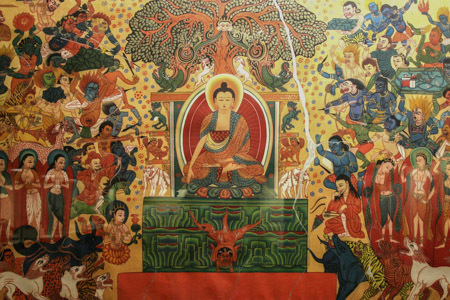 He is portrayed in Buddhist art as a mean-spirited general riding an elephant and leading an army of chaotic devils. These represent the emotions, thoughts and sensations that hinder awakening. 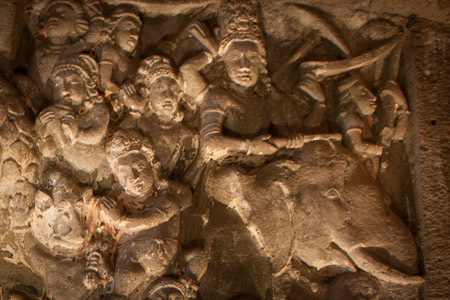 Of particular interest is the timing of Māra’s appearance: so long as the prince was immersed in palatial luxury, Māra remained behind the scenes, but now that he is about to depart, Māra appears in person to persuade Siddhartha to return. This episode of The Great Departure teaches us to expect an increase in internal opposition at the moment of awakening. In other words, in order to prolong consciousness, our efforts must increase. Māra’s opposition will steadily increase through each step of Buddha’s journey and will culminate in the chapter of Enlightenment (which will be examined in a future post on ggurdjieff.com). What do you find when you try to be present for two minutes uninterruptedly? Can you see Māra increasing his resistance? Can you catch the emotions, thoughts and sensations of his army before they hinder you?